Characteristics: flashing white every 10-seconds with two red sectors. DayMark: Brown octagonal, pyramidal skeletal tower enclosing white stair cylinder and octagonal dwelling with green trim and shutters. History: Constructed in 1877-78. First lighted June 15, 1878. Lens: Original: First-order revolving Fresnel lens; Present: Vega VRB-25 rotating beacon; RACON. Focal Plane: 110 feet. Construction: Architect: unknown. Builders: Paulding and Kemble Cold Spring, New York (iron foundation); Pusey, Jones & Company, Wilmington, Delaware (iron tower). Iron screwpile constructed of wrought iron. Visitor Info: From land can be seen on a clear day from the top of Cape Florida Lighthouse. Boats can be chartered out Key Biscayne/Miami area. Characteristics: Three-group flashing white every 60-seconds with three red sectors. DayMark: Dark red octagonal, pyramidal skeletal tower enclosing stair sylinder and conical dwelling; black screwpile foundation. History: Constructed in 1852. First lighted Mach 10, 1852. It is the oldest iron screwpile lighthouse still functioning in the US. On the National Register Listing. Lighthouse light turned off and structure abandoned 2015. Lens: Original: Eighteen patent lamps with 21-inch reflectors (1852); Winslow Lewis. Present: Vega VRB-25 rotating beacon; RACON. Focal Plane: 100 feet. Construction: Architect: I.W.P. Lewis. Builders: Lt. George Gordon Meade. Iron screwpile constructed of wrought iron. Visitor Info: Can be seen by land from Ocean Reef Club (a private resort) on a clear day. Boats can be chartered out of Key Largo to go out to the light or from John Pennekamp Coral Reef State Park. The Florida Keys Reef Lights Foundation has been formed to promote the establishment of a lighthouse museum and future access to the light. Characteristics: Four-group flashing white every 60-seconds with two red sectors. History: Constructed 1871-1873. First Lighted: November 25, 1873. Automated: 1963. Lighthouse light turned off and structure abandoned 2015. Lens: Original: Revolving 1st order Fresnel lens. Present: Vega VRB-25 rotating beacon; RACON. Focal Plane: 136 feet. Construction: Builders: Paulding & Kemble. Iron screwpile, skeletal tower constructed of wrought iron and wood. Visitor Info: Can be viewed from Islamorada at the south end of Upper Matecumbe Key. The Florida Keys Reef Lights Foundation has been formed to promote the establishment of a lighthouse museum with future lighthouse tours and access. Characteristics: Five-group falshing white every 60-seconds with three red sectors. History: Constructed 1857-1858. First Lighted: March 17, 1858. Automated: 1960. Third and last iron screw pile lighthouse in the Florida Keys built by Captain George Gordon Meade. Lighthouse light turned off and structure abandoned 2015. Lens: Original: First-order fixed Fresnel lens; Henry-LePaute 1858. Present: Veg VRB-25 roating beacon. Focal Plane: 142 feet. Construction: Builders: George Gordon Meade. Screwpile, skeletal tower constructed of wrought iron and wood. Characteristics: Three-group flashing white every 15-seconds with two red sectors. DayMark: Brown octagonal pyramidal skeletal tower enclosing white staricase and brown octagonal dwelling; screwpile foundation. History: Constructed 1879 - 1880. First Lighted: July 15, 1880. Lighthouse light turned off and structure abandoned 2015. Lens: Original: 1st order revolving Fresnel lens (removed in 1980). Present: Vega VRB-25 revolving beacon; RACON. Focal Plane: 109 feet. Construction: Builders: Phoenix Iron Co. Iron screwpile constructed of wrought iron. Visitor Info: From Sugarloaf Key the lighthouse is approachable by boat and can be seen from shore. 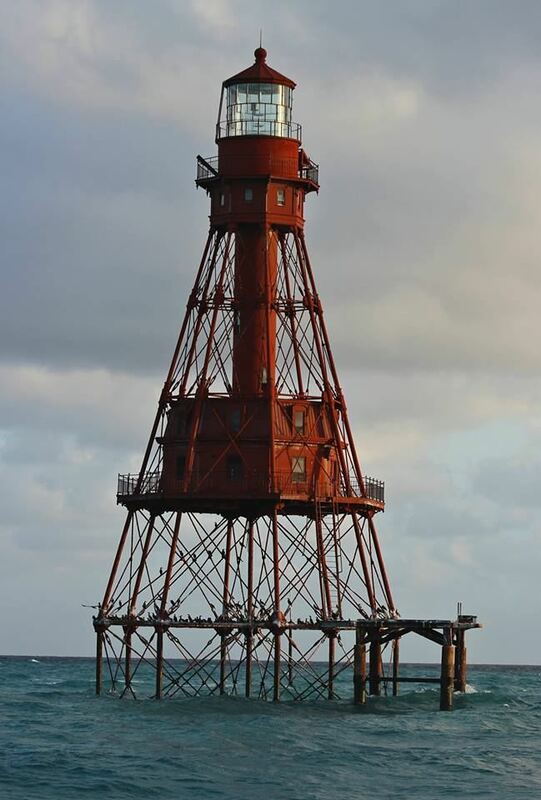 The Florida Keys Reef Lights Foundation has been formed to promote the establishment of a lighthouse museum with eventual lighthouse tours and access. Damage by Hurricane 2017. Lantern room has big hole in it and most of the glass is gone from the lantern room. History: Constructed 1852-1853. First Lighted July 20, 1853. Active, but deactivated 1989-1996 during restoration. On National Register Listing. Lighthouse light turned off and structure abandoned 2015. Visitor Info: Approachable by boat from Key West. The Florida Keys Reef Lights Foundation has been formed to promote the establishment of a lighthouse museum with future lighthouse tours and access. Lightening rod gone and part of ventilation shaft.